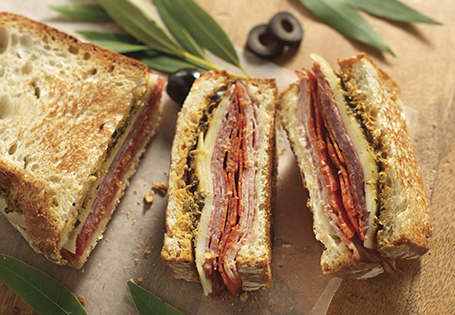 A delicious combination of zesty Italian deli meats topped with a delectable olive spread. In a food processor, combine artichoke salad, giardiniera, olives and salt. Pulse until chunky. Line one slice of bread with ham, pepperoni, salami and provolone cheese. Spread olive mixture on top of cheese. Place second slice of bread on top. Place on panini press or grill until cheese is melted, approximately 6-8 minutes per side. Cut in half, serve immediately or can also be served cold. TIP: If using a grill, place a small sheet pan or skillet on sandwich to weigh it down while cooking.